It is getting harder and harder everyday to rise above the crowd and get your message heard, understood, and acted upon. So how can you create dynamic and visually compelling presentations to exponentially increase the emotional impact and retention of the message you wish to convey? Known as The French Voice of Paramount Pictures in Canada, Nabil Doss is a seasoned speaker and an expert in Influential Communication who has scripted, voiced, directed and produced hundreds of Hollywood blockbuster trailers. With three decades of advertising, marketing and communications experience, a wide range of organisations and professionals have used his consulting and production services to enhance their message and establish a strong brand. Join us for this week’s special encore show to discover the secrets of immersive cinematic and narrative techniques to zero-in on the essence of your message and the attention it deserves! 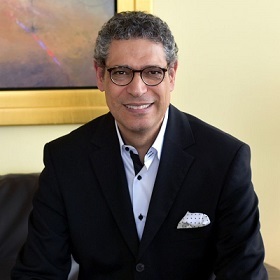 Known as The French Voice of Paramount Pictures in Canada Nabil is a seasoned speaker and an expert in Influential Communication who scripted, voiced, directed and produced hundreds of Hollywood blockbuster trailers. As a speaker and expert in presentation skills, he helps business executives and professional speakers unleash their true potential to communicate at a deeper level and deliver a highly inspirational message to their audience. With three decades of advertising, marketing, and communications experience, a wide range of organisations and professionals have used his consulting and production services to enhance their message and establish a strong brand.